Keystone Hideout Travel Trailers: Room For Everyone! Don’t spend your time agonizing over who to take with on your next getaway, bring everyone! With room to sleep 4- 8 people depending on the floorplan you choose, the Keystone Hideout travel trailers are the perfect companion to a relaxing getaway. 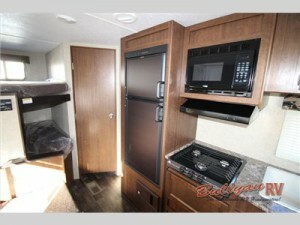 Check out the Keystone Hideout travel trailer. Comfy & cozy interior of the Keystone Hideout travel trailer. If you are wondering where everyone is going to sleep, don’t worry! There is an available bunk and a wonderful, private master bedroom. There is a queen size bed with more overhead storage. There are dual bedside closets for clothing storage! The bathroom has a toilet, sink and shower so getting clean has never been easier. 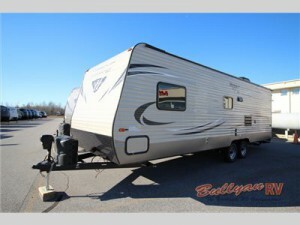 Come in and view the Keystone Hideout travel trailers today and get started on your next great adventure. Contact us today for more information!